View cart “Book for JKSSB Naib Tehsildar/ Patwari Recruitment Exam 2018” has been added to your cart. 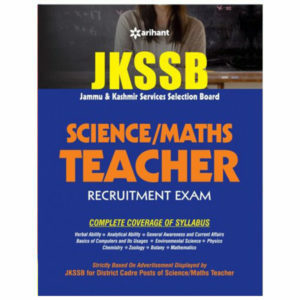 Jammu & Kashmir Service Selection Board (JKSSB) conducts the entrance exam to shortlist candidates for Teacher’s post recruitment. Arihant publishers has come out with a study book to prepare for teachers job recruitment examination. The book titled “JKSSB General Teacher Recruitment Exam” is one of the best books to prepare for JKSSB teacher exam.